Cardio workouts are quite effective in adding power to your ab muscles. They help in keeping the muscles engaged, they help in building core strength and increase the endurance of the body as well. Cardio workouts help in not just strengthening the muscles but help in eliminating excessive fat from the body. If you are trying to strengthen your ab muscles and building strength, you need to include cardio workouts in your regular schedule. This workout shall help in toning as well as powering the muscles most effectively. This is a great exercise which helps to ensure that your heart races well. You need to do the basic lunge well before you move on to this version. You will start by keeping your right foot just ahead of the left foot. You need to keep your core muscles tight. Get in a low lunge position. You will be bending the knees at a 90-degree angle. You will then again jump up, as you slowly switch your feet mid air. You can again land on your left foot just ahead of the right foot. You can then get into a lunge position on your other side. Cycling in a stationary bike helps in strengthening all your ab muscles. It also helps in burning fat from your body. You need to work on a scale as per your own exertion rate, which can be hard, moderate and easy. Warm up for a few minutes and then start the workout. Beginners are advised to carry out the workout for at least 20 minutes in a day. As your body gets comfortable, you can increase the duration to 45 minutes. However, the important fact is to keep changing your pace often, so that your body is challenged every time. 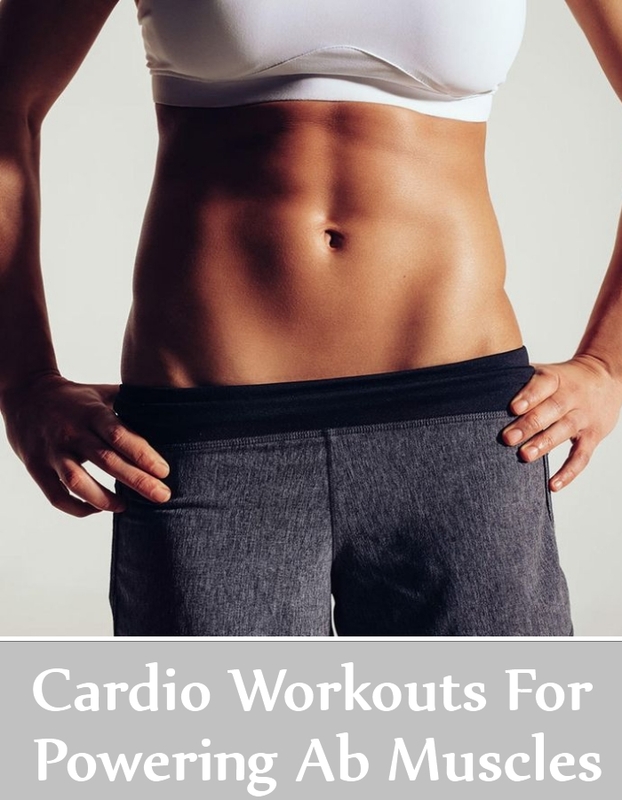 This is one of the most effective cardio workouts which strengthens and tones the ab muscles. Excessive fat from the sides and lower abdominal belly fat is reduced with the exercise, while all abdominal muscles are strengthened. To do the workout, you need to lie down completely flat on your back. Your hands shall be just behind the head. Now, slowly move up your shoulders from the floor and stay in this position. You can slowly move your left knee close to your right elbow. You can again switch sides and then move your right knee close to the left elbow. You need to continuously pedal as much as you can. This exercise is very helpful in targeting your external and internal obliques. You need to repeat this movement at least 10 times to start with. This is one of the best cardio workouts which works on all the muscle groups of your abdomen muscles, especially the abdominal muscles. You can start the workout with a 15-minute routine as you do a few basic jumps for at least five minutes to start. You can workout for a minute at your left and then your right foot, for another three minutes. You can keep alternating using your legs. You will end with a few more minutes of some basic jumps. As you feel your endurance level is progressing, you can workout for the next thirty minutes. This exercise helps in focusing on all your abdominal muscles. However, you need to ensure that you keep your breathing completely steady throughout the process. This is an effective cardio workout which helps in strengthening all the abdominal muscles and adds power to them. You need to stand on your right leg and slowly lift up your left foot from the ground. Brace up your core muscles. You need to jump forward at least 3-5 times. You will be landing on a ball with your foot every time. You can again switch your feet and get back to the start position as you begin the workout. If you wish to make this workout tougher for you, you will be jumping in a box formation which includes side, back, side and forward formation. You can again switch the directions before you hop to another side. Start the workout by lying down comfortably on the ground. Your feet shall be just below the knees. Your hands will be by your sides. Keep your glutes engages and move up your feet from the ground. You will slowly move back to the ground. Keep your back and your neck relaxes as you involve your hamstrings and glutes to move up and down. You will carry out this movement at least 10 times in all. As you get comfortable, you will increase the count to 15-20.